Despite all the trumpet swells and images of Sylvester Stallone with gloved hands lifted high, the Rocky films have always been about loss. The original film wasn’t about an underdog winning the heavyweight championship of the world (spoiler alert: he didn’t). It was about a working class guy defying the odds to prove to himself that he belonged in the same ring as Apollo Creed. It was about finding that person who can make you a better version of yourself. So it’s fitting that the opening scene of Creed II is an unexpected depiction of loss and the consequences of losing. The film opens in the Ukraine with Ivan Drago (Dolph Lundgren) living in a high-rise housing project. His life is gray and grim. This is what happens to the men who finish second, to the also-rans. His one shot at redemption is his son, Viktor, a beast of a boxer who hopes to have his shot at the brass ring that his father failed to grasp thirty years earlier. Adonis Creed (Michael B. Jordan) continues to defend his boxing title against fighters who are not his equal. When the challenge comes down from the Dragos to pit son against son, Adonis can’t say no even though his friend and trainer, Rocky Balboa, sees only disaster and heartbreak on the horizon. Creed II, like the second Rocky film, is a comeback story. It’s the tale of a rematch. Unfortunately for the audience, the trajectory of Creed II so closely resembles Rocky II that the film becomes painfully predictable. The plot beats of the two films coincide to the point that Creed II ceases to be an homage to the original sequel and basically becomes a rip-off. Where Creed felt fresh, like a new spin on an old story, Creed II feels like an old spin on a tired story. Everyone in front of the camera does justice to their characters, and the film mostly coasts on the talent of its three leads. 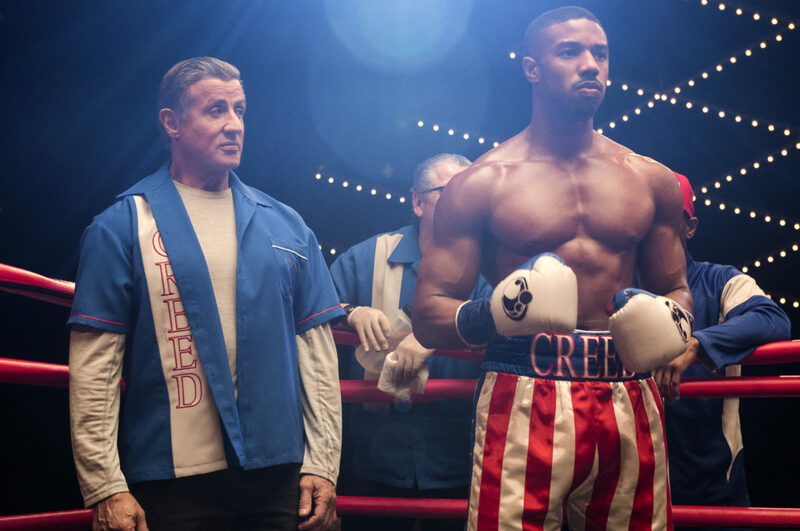 Michael B. Jordan is charming and vulnerable as the young champ, and Sylvester Stallone continues to find layers of humanity in a character that long ago threatened to become a cliche. Tessa Thompson makes the most of the thankless wife role, but the screenplay doesn’t give her much with which to work. The big difference maker is the absence of Ryan Coogler (Black Panther, Fruitvale Station) behind the camera. The kinetic visuals and the energy of the original film are missing in action. Where Creed electrified its audience, the sequel is mostly inert. Creed II feels flat by comparison. It’s by no means a bad film and should make a decent holiday crowd-pleaser. It simply fails to transcend its genre like the first film did.